Hello Everyone! I know I haven't posted for a while and I am not sure I want to continue with my blog. There is so much social media and stuff gets posted on facebook, instagram and blogs and it is just so much to try and get to all of it to comment on and I feel so bad when I just can't get to it all. I am still trying to figure out what I want to do and how I want to do it. I do know that I want to get back to creating layouts that tell the stories. 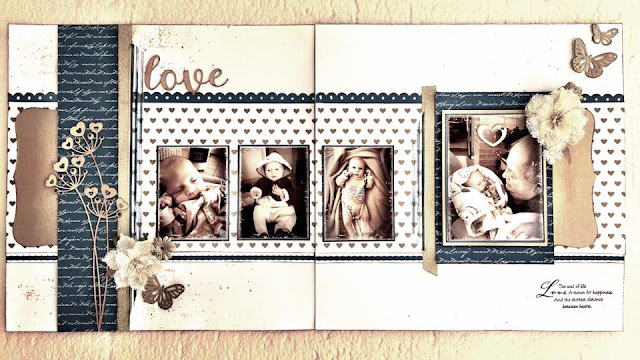 I have become so sucked into creating beautiful layouts that I have forgotten my primary purpose for scrapbooking, which is journalling AND... I want to start using my stash. I know! So I have been watching videos and reading books and I just know that CAS is my style and that the journalling comes first followed by the photo/photos and I don't care if they are not so good if I want to tell the stories. This journey I am enjoying so... we will see where we go from here. I am back teaching... Only once a month for now and I don't know if I will do more I just know I don't want it to be a chore, I want to enjoy it and share what I have learned. I am going to be doing two sessions on one day and I had my first one a couple of weeks ago and it went really well. In the morning I did a double page layout. 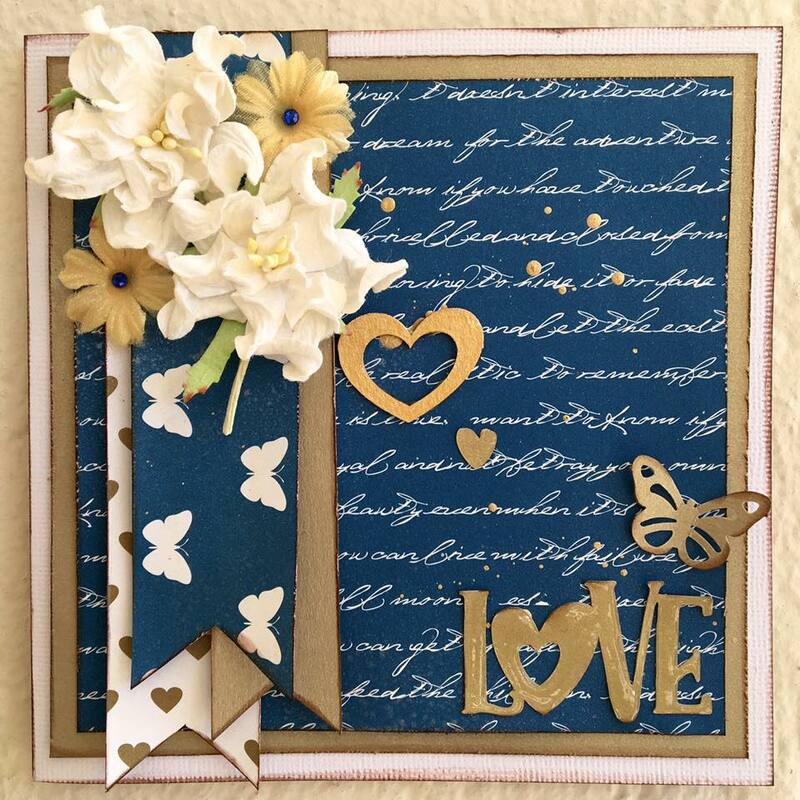 I used papers from the new Lady Pattern Paper range and chose to work with the blue and gold on white card stock. I added some strips of gold glitter ribbon and gold paper and the chipboard title and flowers were painted with gold ink and stuck on. Storm was so worried that her dad showed so little interest in her pregnancy no matter how many times I told her that it just wasn't his thing and that he would be fine once the baby arrived and just to accept it for what it was. Of course I was right, I am always right :D He is totally besotted by this gorgeous little thing, even though she is not doing much right now. He is not really a little baby person, he is much happier once he can play with them and chase them around and talk to them but he does love to see her and get his snuggle time and you can see by the look on his face that he adores her. Already she is engaging with whoever she is with and smiling and gurgling away capturing hearts all along the way. I know from being a mother that there is always more than enough love to go around and it is the same with your grandies only better. <3 I can't wait to see how this relationship develops and the bond that she will have with her grandpa. It will be strong and happy, and it will be forever. In the afternoon I did a single layout using the same paper range. I chose to use a white background for this one too and used the left over bits of paper and some washi tapes to create this layout. 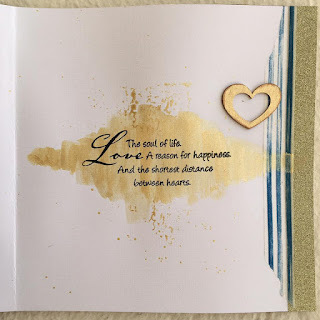 The title, heart, arrow and book plate are all chipboard that I painted with the gold ink. My journalling (on the back of the layout) says. We also had a card to do. Also with the left over pieces of paper. A 15 x 15 card with a couple of mats and banners and some flowers. The heart is a chippie painted with the gold ink and the title and the butterfly are punched from gold paper. Thanks so much for stopping by to take a look and for taking the time to leave me a comment. It is really very much appreciated. Oh Valerie, it would appear that we both went MIA and decided to return to blogland on the same day! I must be honest and say that Instagram and FB does not "tell the story" like a blog does. I am in awe of you teaching your craft to others....and your pages are so beautiful that I am sure that your class will be a delight. Hello girlfriend...so nice to see your posts. You know...you don't have to post everyday and you don't have to show each and every project you create...it's about posting, because you really want to, on a certain day, and share your love and creativity. You are so right about all the social media and trying to find time to respond to it all, but just remember that everyone is in the same boat and you don't have to feel bad if you don't get round to everyone or every post. It's about finding joy and inspiration in those visits. 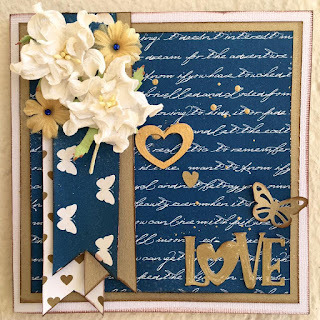 Beautiful card too...so great that you are diving into your stash! Welcome back to blogland. I so understand where you're coming from. I'm almost at that stage too. But chooding between social media, FB etc, I prefer the blog as it is more personal and tell the story much better. So please don't stop blogging. 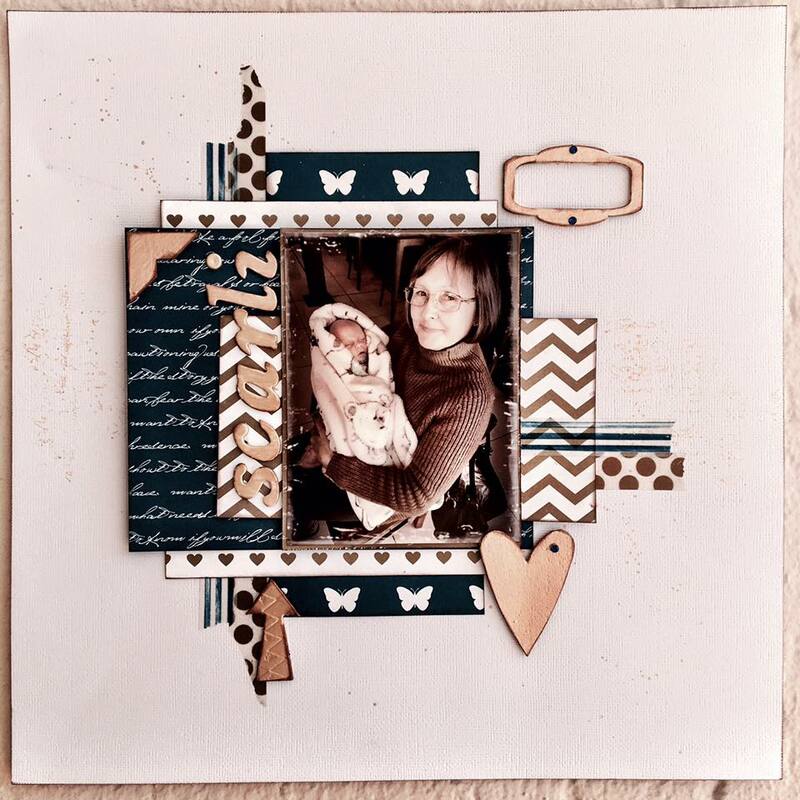 I really enjoyed your post today and your layouts are so gorgeous. (as is your granddaughter). I love your style. Don't feel that you have to follow the latest trends and buy the 'in' products. I agree with everybody else that it is the story that counts. Whoever looks at your albums in years to come won't know what was in fashion in the scrapbook world at the time. Go you Val for understanding how caught up we can get in the social media side of things when all we really want to do is scrap! I'll be following your progress with interest! What amazing creations you've made - absolutely wonderful! 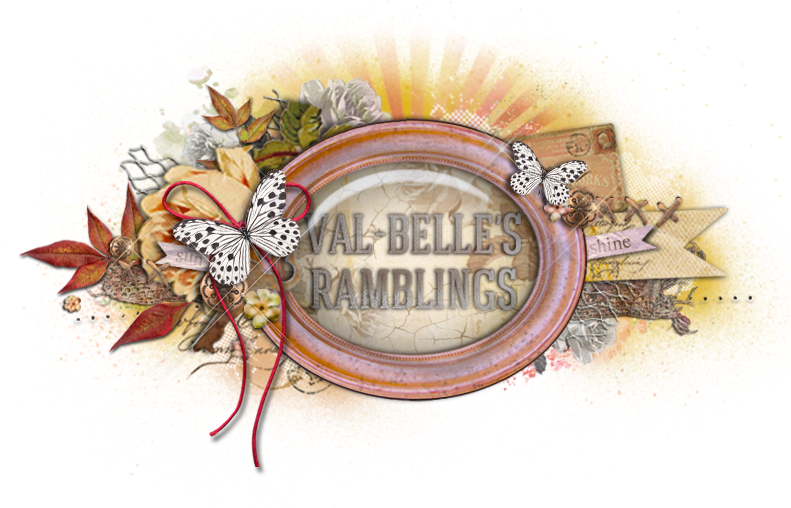 Great to read a Val story again and to see what you have been busy with .Enjoy your teaching , crafting , children and grandchildren!